Boundless recently released their coolest product yet, the Boundless Tera, which utilizes true convection heating and is an evolution of many features found in the CFV. The Tera is a true beast and gets accolades for its stainless-steel oven, easy pop off top, and ultra fast heat up time. There are a multitude of upgrades from previous Boundless vaporizers, that serve to make the Tera truly stand out as a premium, high-end device. Priced at just under $220, this unit is rather bulky; the Tera is portable but not super discreet, it was designed clearly in mind for heavy-batting users that love to rip. The Tera looks like a muscle-bound, brother of the Boundless CF; it stands just a little shorter than the CF but the Tera is most definitely sturdier and heavier. It features an LED screen on the top of the unit for temperature display. The power button is located towards the front and there are 2 buttons placed on each side of the device. The mouthpiece sits slightly above the heating chamber, like most of the units produced by Boundless. However, the Tera's swivel mouthpiece is a little easier to remove from the device and it is magnetic. It is simple to maneuver, as it swivels in and out like the other units. Although the device is bulky, the Tera's grooves are perfectly designed so that it sits comfortably in your hand and it never gets hot during sessions. The heating chamber is made up of stainless steel and the unit creates an even heat distribution from its convection airflow. Additionally, the Tera can be rigged into operating as a desktop unit since it comes with a water pipe adapter. The water pipe adapter is great for extra filtration and bigger hits. The cloud quality of this bad boy is majestic. The Tera’s strongest point is that it produces HUGE clouds, the first draw from it is mainly pure taste but the clouds steadily build and get thicker from there. Boundless stepped it up with the stainless-steel oven that is ingeniously constructed to provide true convection, and even temperature distribution. The Tera manages to slowly cook the herb while evenly distributing heat so that users can achieve continuous flavor from the terpene profile of the herb and enjoy continuous thick clouds in every session. The Tera has two 2500 mAh user removable and replaceable batteries, which is great for customers on the move. However, the device does not have pass-through charging. 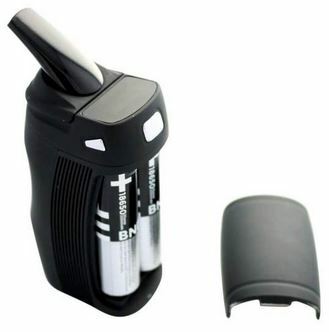 The Tera battery lasts around 45 mins and it is easily able to accommodate for about 8 to 10 sessions. It takes about 3 hours to charge but if users are trying to use the device on a very frequent basis, it's a good investment to purchase an extra set of batteries and an external charger so that the Tera is always ready ready to go. The Tera is pretty easy to use, and like most devices, pressing the power button 5 times will turn it on. Once the device is on, the LED screen immediately lights up with the Boundless logo and proceeds to the temperature display. To enjoy a session, remove the mouthpiece and pack up the heating chamber with approximately .5 of ground dry herb. Once the oven is loaded, utilize the buttons on the sides on the device to change settings and to select the desired temperature. Clicking both side buttons at the same time will change the temperature reading from Fahrenheit to Celsius. Once the desired temperature is chosen, press down the power button for 3 seconds for the unit to start heating up to the desired temperature and users can now have a perfect vaping experience. It is recommended that users run a burn off session before enjoying the device for the first-time. To do this, simply turn the device on and press the power button 3 times to enable concentrate mode. This will enable to unit to burn off everything from the manufacturing and shipping. For users that wish to use the Tera with the waterpipe attachment, the instructions are very simple. 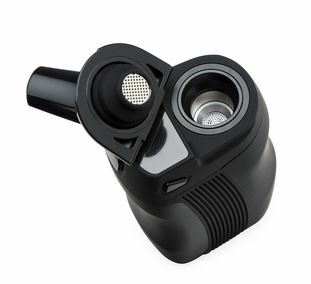 Replace the mouthpiece with the attachment after packing the heating chamber and then place it into the stem of the water pipe, turn it on and enjoy. In summary, the Boundless Tera is a premium unit that provides strong, thick and tasty vapor in every session. It has a decent battery life with the convenience of being able to change the batteries out, and the stainless-steel heating chamber makes the sessions enjoyable with continuous clouds for users to relish in. There is almost zero negative to be said about the Tera, however, users should be warned that works best with dry herb, and the quality could be better when vaping concentrates. Other than that minor aspect, the Tera is flawless in vaporizing dry herb and if that’s what users intend to primarily pair it with, they will never be disappointed.